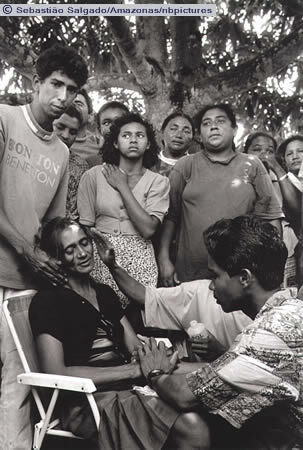 The mother of Oziel Pereira, one of the leaders of the murdered peasants, being comforted by members of her family during the funeral ceremony in the city of Paraupebas on 20 April. Oziel Pereira was seventeen years old and was removed from the scene while still alive. After being handcuffed and beaten by a group of policemen, he was liquidated by a shot in the head. Pará, 1996. 'Young man of 18 who was killed during the state police ambush at Eldorado de Carajás. He was tortured to death and made to cry "Long live the MST"' (Calend�rio Hist�rico dos Trabalhadores. S�o Paulo: MST, Setor de Educa��o. 3a. edi��o, 1999, p. 38).